The M220-PBS can detect the following conditions in 3 phase 3 wire system: Phase Unbalance, Phase Loss, Phase reversal, Phase Sequence, and Symmetrical under voltage. The M220-PBS is used to detect phase loss and unbalance in a system using motors, generators, heater elements, transformers etc. A phase unbalance as small as 10% in a 3 phase motor can cause the temperature in the motor winding to increase by more than 120%, but correct setting of the M220-PBS will ensure this does not occur. Protection against open phase regenerated voltage, created if a single phase should fail, is also provided. Customer adjustment of the unbalanced voltage from 5% to 15% is provided along with time delay adjustment of 100mS to 10S. The M220-PBS has the additional benefit of having symmetrical under voltage protection. This means that if all 3 phase voltages remain balanced, but drop below a preset voltage, the relay will de-energise. The under voltage is externally set from 90% below the nominal voltage, to 70% below the nominal voltage. All LEDs will be green when the percentage unbalance measured is below the unbalance set point, and all three phase voltages are above the symmetrical under voltage set point. If the unbalance measured is above the set point the unbalance LED will turn to red and the relay will de-energise. If the symmetrical under voltage is blow the set point, the under voltage LED will turn to red, and the relay will de-energise. If an incorrect phase sequence is detected both fault LEDs will flash red. The voltage relays monitor their own power supply so auxiliary power is not necessary. A green LED indicates a supply is present. 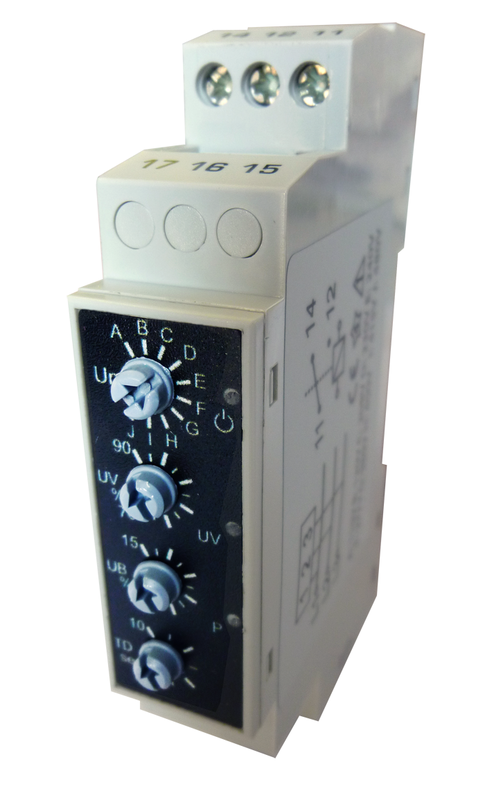 The relays feature an adjustable power supply, allowing flexible selection of the connected nominal voltage. Ordering information available in the brochure.